I built the following map of the United States (shown below) identifying 276 cities in the United States with population greater than 100,000 people. I then drew a 300 mile diameter zone circled around each city (150 mile radius). 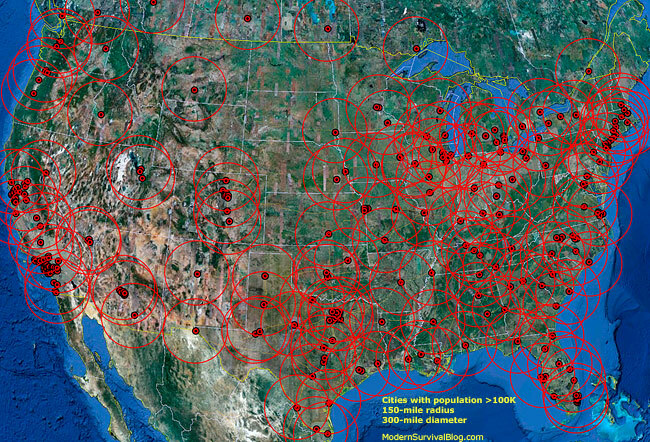 I chose the 150 mile radius as a distance which in my estimation approximates the average ‘reach’ of those (average people) who may choose to leave, evacuate, or bug out from the city region due to SHTF collapse while in search of safety, shelter, food & water. I am not defining ‘SHTF’ in this instance (the specifics of which would affect choices of those considering whether to stay or go). Rather I’m suggesting that “if” a bug out decision were to be made, the majority of those who leave, on average, will probably get no further than about 150 miles. And this presumes that they’re in a vehicle. Traveling on foot is a whole different ball game. Why 150 miles? I based it on the average range of a typical vehicle (mpg x fuel tank size) coupled with the likelihood that on average people may have 1/2 tank at any one time. I also made the assumption that no additional fuel will be available. More: How Far Might The Zombie Hordes Get? That said, many or most may not leave at all. – no survival kit, no bug-out bag, no 72-hour kit, no plan, etc..
Why did I build the map? What’s the significance? The purpose of the map is to help identify regions which may be preferable for one’s ‘survival retreat’ security based on the potential ‘reach’ from the city regions in the event that there is indeed an exodus. Plus, I just like maps. Note: I’ve included cities on the southern border of Canada which are populated greater than 100,000 since this may affect some of the northern states of the U.S. although it’s probably doubtful that Canadians will head south to the United States during collapse. Note: There are regions within some of the 150 mile radius zones that will likely remain relatively secure due to a number of reasons, some of which are geographical. Note: Within some of the zones there are natural obstacles such as mountains, forests, canyons, lakes, etc.. which present barriers even though relatively near population density. Note: You might also visualize a 10 mile wide corridor along every main road and highway within your region of interest. Beyond that corridor will certainly be ‘safer’ from an exodus. Note: Although looking at the eastern half of the U.S. on the map looks like there are very few safe places, actually there are numerous small communities scattered between those 100,000+ population centers that could easily function as safe havens. Note: I may have overlooked a city or two greater than 100K (although I believe I’ve got them all) and there are those between 50-100K which are also considerations. This is just to give you an overview. WILL THERE REALLY BE A ‘GOLDEN HORDE’ ZOMBIE EXODUS? It is my general opinion that “if” there were a terrible societal collapse and that of collapsing infrastructure or other catastrophic events, there may be fewer on the exodus than the general opinion within the prepper community. Most of the population will convince themselves that .gov will adequately help and assist or that the ‘event’ will fix itself and things will go back to normal (normalcy bias). Many or most will probably stay put (some of the reasons listed above). And when things get real bad, it will be too late for most. They will be weak from hunger and thirst, and the conditions out on the roads may become impassible and dangerous. So in theory, a bug out location (or one’s own home or retreat) will likely be less affected by a major SHTF exodus if in a region outside the overlapping circles or as few as possible. Yes, there are quite a number of logical exceptions, a few of which I just mentioned. It’s simply food for thought. I originally built this map a number of years ago. I’m re-posting it for your potential interest and comment. Related: Safe Distance From U.S. Nuclear Power Plants? Related: The Perfect Bug Out Location Survival Retreat? Thank you for the map Ken. We are where we are and have no plans to leave. We moved here from an extremely large Texas city. One of the things I have done is view our farmstead from views of dangerous weather, dangerous people, and dangerous government. I feel comfortable with our selection even though we are within circles of many of the maps that have been provided throughout the years. Short term emergencies – our village has already proven itself as people came together and had roads cleared and electric back on in less than 24 hours even though the state of NY said it would take 5 to 7 days minimum. Everyone pitched in. Know the devil nearby. Small towns afford you the ability to mostly know who will present a danger in bad times. Since gangs or organized mobs will be the largest obstacle in my mind, we won’t have that close by…but possibly coming later on as they escape large cities. Most will continue moving south to soft targets rather than spreading out where it appears uninhabited in our area. We already look depressed so why would they look for targets here while traversing the federal highway? I believe they will head south because it is COLD here. And lazy people, gangs included, will want to get by doing the least amount of work. Many will sit in their homes and just perish in the larger towns within 60 miles of us, but those aren’t the ones we concern ourselves with. At some point, there will be government interference (ours or possibly international) and that is the part that I am not sure how will be handled. Because you cannot take a knife to a gunfight and they have bigger and better weapons and sh!t for brains. That is a conundrum. I have the same opinion about the cold I think season play apart on what people will do. When cold sets in (late fall and winter) they will head south. I also have the opinion that they will follow the easiest routes, hence they will travel along the main highways (freeways). Like water they will follow the route of least resistance. We don’t all have the option to live out on 50 acres where the nearest neighbor is 5 miles away. So my option was always 30 to 50 miles away from big cities and as far away from main highways as I could get. So I’m in an area were they are small towns 10 to 15 miles around me and the nearest city is 40 miles away with the nearest freeway 15 miles with the though that should things go south, winter is my friend, if it doesn’t kill me. Weather will direct many to move. The cold will definitely move people south. Places that are too hot will also move people north. Living in the hot weather without air conditioning will be miserable and a killer. DAMedinNY: Jeeze! I hope you’re right about people going south because of the cold. I live in a fairly large city about 100 miles south of the Canada border in Idaho, and I just love the cold. Not a problem, at least until there’s 3 or 4 feet 0f snow, and zero degrees. Then I just hunker down a little. I think if people go south because of the cold, very few will come back when it warms up. Mostly because a lot of them will be deceased or don’t have the means to come back. It’s the period in between before they leave that I would worry about, with everyone looking for food, resources to keep warm, etc. That’s when you may have to defend your preps. all above, cold and yes we may be in for years of cold. I lived in Ft. Lauderdale for 3 years in 1979-1981 and the transient homeless were there then. Moved with the weather so to speak. So yes folks will avoid the cold anyway they can. I have to agree about the cold – if you look at the Lake Tahoe area in the winter, they have no homeless people. Those folks would end up as Popsicles (and have) trying to live in the mountains in the snow and cold. Not as many homeless people in Northern areas. Winter is brutal on them. As far as how we can survive Winter if the grid goes down or there is an ecnomic downturn that makes heating fuel a lot more expensive. Cold weather can be planned for, it’s called a wood stove. In the past (pre-grid and electricity) people survived well in the Winter. No reason we can’t today with a bit of work and planning. I heat with gas, but I also have a wood stove and a somewhat large wood pile. And yes it looks a bit unsightly. I get a lot of free wood (so much I now turn it down when offered) so wood fuel is not a problem. Wood only heat also ties you to your home as it needs to stay above freezing all the time. There are ways around this, but it takes planning, work and an adjustment to the lifestyle we all think we must maintain. Years back I was given a private tour of old colonial homes in New England. The whole family would stay in one room where the fireplace and the side cooking areas would be located. The room was closed off from the rest of the house. Just one room to keep heated. The ceiling was low too. About 6′ or so. would need to be done. Having enough wood and food on hand too. Having a basement would be a bonus. Making sure you don’t kill yourself from carbon monoxide. And for the most part our homes are much better insulated. Also why you have to make sure you have some ventilation. My Great Grandfather lived in Siberia in the 1800’s. He wrote about their woodstoves; they had tiled platforms over them and they would put their straw mattresses on top of them in the winter. I know a Woman in Sonora, Ca. Who has a similar platform in the shape of benches around her kitchen table. I don’t know the mechanics of it but I guess that is how they did it in the old dayz. Somehow extend the air flow of the stove to heat tiles so you don’t freeze at night. Erika what your describing is a Russian tile stove. At Permies dot com they are doing modern versions of that is called a Rocket Mass Heater. They are a bit difficult to retrofit in a typical home but very efficient wood heat. You also have to take into effect ( I live not far from there ) if it is winter there will be no plows out clearing the roads so no travel through the passes. Tahoe would be isolated from the rest of the world for months at a time. Think Donnar party. Ken, this map is really good. I appreciate your take on how a potential SHTF event might shake-out. Have you considered putting this map on your right-side for everyone to see? Yeah, it’s that worthwhile of inspecting!! Heck, since you like maps and the past 2 days have given us some great images to think on, what about a special topic-tab on Maps? PS The east coast looks like a Slinky party is going on… I need to show this one to the hubster and tell him AGAIN why the Dakotas would be a great place to be. I happen to love the rugged terrain there, and the lack of population is a real benefit. Good fly fishing in the Dakota’s too! I had forgotten about this. I wanted to move to the country when I retired but my wife did not. We are going to ride it out. This doesn’t mean we will parish in the first wave of what ever comes. There is a good chance we will be able to defend our selves for a while. The map shows me that from where we are, there is no place to go to out run the horde. What worries me is the steady increase in violent crime and risk of random valance in my area. It would be nice to live some where that crime was not going on all around me. The day to day drum beat of drive-bys, robberies, and home invasions is the primary threat we have to face here and now. I am on alert and at the ready to protect and defend now!. The best location to live in after a shtf/teotwawki event is not as simple as distances from population centers in my view. I live in what many would consider secluded, but quite a bit of the property in our area is owned by absentee owners. There are quite a few hunting/recreational cabins scattered around that are owned by “weekenders”. The population on my 7 miles of unpaved road doubles, maybe triples during various hunting seasons. I’m guessing that many of these absentee owners plan to “escape” to these environs should the shtf. I’ve met many of them and made friends with some, but a few I’ve had run-ins with who are not people I want around on a semi-permanent basis. I’m sure They won’t be any better when things go bad. Thankfully, most other folks around here feel the same way about them. Historically, when disaster strikes, the population centers get the bulk of government assistance first. Rural areas take a back seat. If there is any semblance of a functional government still in place, I expect this will still be the case. If not, distances from these centers, especially if motorized transportation is severely limited such as after an emp or cme event, in areas where 150 miles straight line carries one through endless mountains and hollers, or 250+ miles by road, this would really slow down migration of the masses. My location places me at edge of Ken’s 150 mile radius of 3 population centers, but road distances places me probably an additional 75 miles from each. Cross-country trekking to my place would be a daunting task for all but the most stubborn and fit. Whatever, I’m at where I’ll be, no matter what happens. I’ll deal with whatever comes my way. Even if theres no EMP/CME type event ill bet most of the roads will be clogged regardless of how much fuel people have in their vehicles. I watched people block the roadway just so they could get propane, so the dummy in his honda beater is blocking anyone from getting by just because he didnt want to lose his place in line,,,,, buncha dummies, just imagine this on a scale related to the population of the burbs, nobody goin nowhere after a certain point, and that point will arrive sooner than most think. We live in a area that has a two lanes going north and south and when a chicken hauler turns over its blocked for hours. In a SHTF it would be bumper to bumper parking lot. The road has a bridge over a very large gorge at one place making a choke point. I have heard some of the locals talk about shooting that bridge in a disaster. Now I would chalk that up as breakfast talk or Friday night beer talk at the V.F.W. Only thing is I know some of these peoples back grounds and MOS. If a SF tells you he is going to do something you can take it to the bank. Keep your head down as I feel something evil comes this way. Im happy to not be anywhere on the continent! Mountains to the east, mountains to the west, and one main highway through the area. This is good and bad – it keeps down the gold horde traffic but the ones that make it through are the tough ones that I need to defend against. . The map is great my only concern is that it leaves very few places that are safe quote unquote. I grew up on the left coast and have lived and worked in the west most of my life. So if I have not lived there I have driven, hunted or worked in most of these area’s. It’s cold, flat, mountainous and full of cults I don’t belong to. I and my crew have been refused service at restaurants, gas stations and other businesses in Utah and Nevada as we weren’t from around here. At one motel was told we could stay one night when I asked about six rooms for two weeks. Next thing I know the Sheriff shows up and told us it would be better if we went down the road to a Res motel. First Nation folks were over joyed to see six rooms rented and a crew of hungry and thirsty men show up. Now I live in the North Georgia mountains and to date the Southern Baptists have never refused my wife and I service. I even went down the road and attended a Sunday service at a small S.B. church. Very nice folks but a little confused about why a Jew was coming to service. Told them I felt I needed to know about my neighbors and the people in the area. One women told me she had known a few J.W. over the year’s. The poor pastor almost fainted and we all had a good laugh. I think we will take our chances here in the Confederate States of America thank you very much. Plus, I just like maps. Fortunately many will stay put initially. Then once it is too late they will be stuck or be greatly limited in movement. Utilizing local geographic barriers can make up for a deficiency in distance. Weather will also prevent travel, both the heat and the cold. I decided to move far north to prevent lots of hordes from coming my way. I understand that with a properly built residence and supplies, one can easily live in cold environments. I am glad to be in the Western Dakotas due to its remoteness and even here we will have our “neighbor” problems. I personally do not see the purpose of long term prepping unless you have serious distance between you and population centers. I hope and pray that we all never find out if we picked a good location for our homes. The maps are awesome! When expanded to the largest size available, we are able see that we are in a area which would require one additional tank of gas to reach the next largest city. Do we feel comfortable with that knowledge…..yes and no. Yes, as many would not have the forethought to have that extra fuel on board when traveling. The NO, if this city keeps growing from out of towners, this city will be over the 100k mark sooner rather than later. To me it reminds me when we lived a year in Phoenix AZ in the 80’s, way to close for comfort!! To the west hardly anyone and the Pacific Ocean. To the north almost no people, mountains, and the Straits of Juan de Fuca. To the south some people, most who would have to cross the Columbia River, make their way around a couple large bays, and cross more rivers and big creeks. To the east there’s the masses. Between here and there, though, there are mountains, bays, rivers, large creeks, the Puget Sound, several MSAs to get through, and a large joint base that straddles (strangles) the main road south and around the Sound. The base, at one point, covers most of the area between another set of mountains farther east and the water. Reassured that we’re relatively far enough away from big city troubles. We’ve got sufficient challenges without them. Really appreciate this blog. Thanks Ken. BTW you can google the name of a town followed by the words gang map and get some really interesting info. Certainly determined where I was going to live and commuter routes I would use last time I moved for a job. Slight error in your calculations/reckoning of distance, Greeley, CO. is 115 miles from my home yet you have me living in a clear site. BTW Greeley has a population of 103,000. Just sayin’. Spent some time in Greeley – pretty stinky place, but a great place for beef!! Absolutely, and many thanks. Did you ever consider constructing an overlay map indicating population, fallout and other dangers? Great maps. Keep in mind that the circles in reality will be smaller since they represent “as the crow flies”. Actual roads bend and twist and you are going to hit 150 miles before you hit the edge of the circle in many cases. There are a myriad of other factors that will come into play, but this map is a good starting point to begin assessing potential herd migrations. Florida, a few years ago, decided to evacuate South Florida ahead of a storm. It was a real mess. They closed the south lanes of a divided 4 lane hiway. Traffic was at a standstill in short order. Some folks stranded all day, never got out of the danger zone. Point is– if you do not leave soon enough— you ain’t going anywhere!! Yes, the big cities will get the aid until the aid runs out. When Katrina hit, and the NOLA inhabitants trusted the Mayor, they ended up trapped in a stadium overflowing with people, crime, lack of food and water, and no sanitation. Keep in mind, this was an ISOLATED event. And even then, the Leviathan was stumbling around, blind and incompetent. There was a small group who thought for themselves, pooled their money for fuel, commandeered a city bus, and drove to safety. Now picture something a little bit more far-reaching. Watch the movie CONTAGION. Look at the opening scenes of some of the more recent Si-Fi fantasies such as ARMAGEDDON or DEEP IMPACT. If you want to get really far out in the ozone, go to The Common Sense Show website and see what delusions Dave Hodges is currently hawking. It will give you food for thought. In the Rawles series, people of all persuasions found ways to make it to more secure areas. Not all of them were Bible-believing straight arrows. Yes, there will be traffic jams, chaos, death, and a total social/political/cultural breakdown. But the will of humanity to survive is extremely powerful. Desperate people will do desperate things. Have your plans. Watch your lines of drift. Be ready to think the unthinkable and do the unimaginable, if you and yours wish to survive. There is an app called Zello that is like a walkie-talkies, people have it used to help with comms. Hilo starting to flood, warning sirens in Honolulu. I just stayed home today,,, Maui barely any rain today, no wind, real gloomy. Probably best to own a large boat. Live in Florida. And relax. When I moved to my present home the closest (50 miles) large city was Austin, 1,500,000 people. The closest small town (2500 people) was 13 miles away. But I failed to consider the growth that can happen to a city. Some of the new Austin suburbs are now within 30 miles. Austin is filling up with California refugees, their culture is awful. The cultural influence of these California refugees extends even into the area where I live in the country. So there is a lesson to be learned here. The lesson here is not how far you are from the city but how far the influence of the city extends into the area where you live. The voting influence of the city dewellers now effects the local city/county ordinances around me. I am sorry for your situation. The same thing is happening up here in North Idaho, but not as rapidly as in Ada County(Boise). It’s white flight, but these newcomers are bringing all of their syphilitic, leftist thinking with them, which destroyed California, the state of my birth. The same happened to me. I left while I could. I never thought Hutto would fill up with people Now I live on the edge of a National Forest in deep deep east Texas. According to the map I would be ran over by people from Houston, Beaumont, and Shreveport. The fact is people don’t want to take on the Big Thicket. So my acreage is quite remote and I have awesome neighbors that are really self reliant because this is the culture here. Everyone grows a large garden, has numerous farm animals, and vegetable/fruit canning is a community event. The oppressive heat can be a factor. If you haven’t visited the Alabama-Coushatta Reservation, take time to do so. The history of that tribe and Texas will make you proud. Been years ago, but they used to put on a play there called “after the sundown” as I recall. Texas made a treaty with them during Texas’ revolution against Mexico, promising their lands in the Big Thicket would remain inviolate if they remained neutral during the war. Later, when Texas became a state, Texas demanded that treaty be honored in perpetuity. That is the only treaty with an Indian tribe that has never been violated. Dennis, yes I have several good friends in the tribe. My background has put me on the Reservation for many years for training purposes. “Indian time” never bothered me so I was always welcome. I came from this area before I moved to central Texas for work reasons. They recently reopened their gaming center. They have a looming fight with the State coming as well as other tribes that have lobbied against them. I don’t care for gambling myself, but I support their sovereign right to provide that service. It should be an interesting political event. Several years of reading first time posting, so here it goes. I feel that living in north west Minnesota is a pretty good place to be when it hits the fan. Regarding the map there are a couple cities missing that could have an impact. Fargo, West Fargo, and Moorhead MN. These cities are all connected and this MSA is over 100k. Also Duluth and Hermantown are connected and over 100k. I agree most would stay put also out winters can cool down so most are not equipped for that outside of thier city. @Up North, thanks for reading the blog all this time! Regardless of the map that I presented, it’s great that people are thinking about locations with regards to population density. Those who live where they do, will have better insight about their local regions and what may be better than others. It’s good to hear specific recommendations. If a “golden horde’ does materialize which in my opinion is dubious, they will only have a few weeks in spring and fall to horde around. I think cold and heat will be huge deterrents. People are spoiled to climate controlled environments. They would drop like flies from either extreme. Other things to consider besides just distance. How far are you from the highway? Nearest paved road? Nearest unpaved road? Is your site visible from the road? The terrain: flat, hilly, or mountainous? Walking up hills is a lot of work, and driving in hilly country burns a lot more fuel. Does your site have a wall around it? Do you own an intimidating breed of dog, preferably more than one? I never cease to be surprised at how many people who grew up in the city find rural areas intimidating and have some idea that they are populated by crazy hillbillies ready to shoot at any stranger who gets too close. It’s really funny, but maybe it’s a good thing.